If you want to remove the sim card from your Samsung Galaxy S5, because you sell it or you switch to another mobile telephone carrier, this can sometimes lead to problems. The Sim card is inserted into a Sim card slot, from which it is very difficult to remove. The problem is that the Sim card is very difficult to grap. 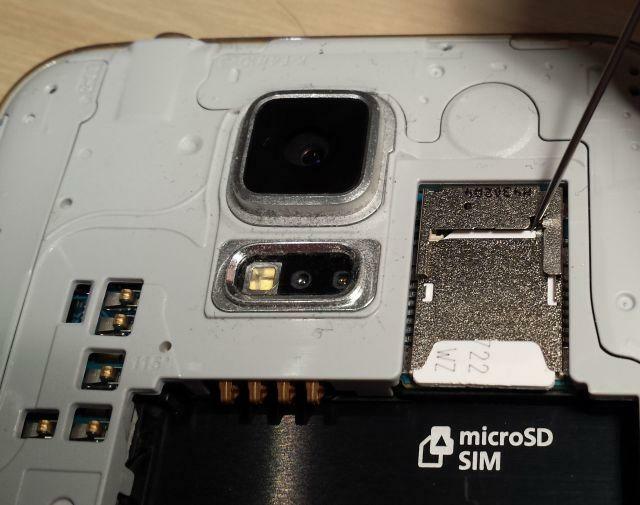 The tight fit in the sim card slot of the Samsung Galaxy S5 is the reason. - You need a sewing needle. Now open the battery cover of your Samsung Galaxy S5 and remove the Micro SD card, if inserted. Underneath lies the SIM card. With the needle you must now slide the Sim card as shown in the picture a little bit forward. The removal of the card from the slot is then easier, beacuse you can grab it with your fingers. You have to be very careful with this method, so that you will not damage any components of the Samsung Galaxy S5 with the needle. Dexterity is of course needed. We hope this tip has helped you to remove the Sim card of the Samsung Galaxy S5. Much better if you use duct tape or any kind of adhesive tape and stick this in to the exposed part of the sim card and then gradually pull it out. The tape method worked beautifully, thanks!